Mayor of Derry City and Strabane District Council, Cllr John Boyle, is urging the public across the City and District to get behind his specially arranged Mayoral Christmas initiatives – starting with his ‘Little Dash of Christmas’ event at the Alley Theatre in Strabane this Saturday. 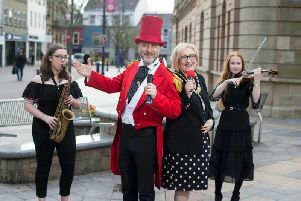 The Mayor will also host his Christmas Tea Dances in the Guildhall on December 5 and 18 and Santa’s Circus Workshop in the same venue where he will invite families to transport themselves into a winter wonderland on Saturday, December 8 and Sunday 9 from 12pm to 5pm. Saturday’s event in The Alley will include the screening of family Christmas movie ‘The Star; at midday and a Starry Christmas Workshop from 2pm – 4pm with face painting, balloon modelling, arts and crafts, music and games and walkabouts. “The Tea Dances have been a great way to socialise with people this year and get a chat to people of all ages about the issues that affect them, I hope as many people as possible can join me for a mince pie and a dance in the Guildhall in December. A Grand Christmas Procession through the city centre and the return of the popular Strabane Fayre are just some of the highlights in Derry City and Strabane District Council’s exciting programme of festive events for 2018. The popular Christmas Winterland Markets in Guildhall Square will also make a welcome return from Thursday, December 13 – Sunday 16 with a bar serving craft and artisan drinks, live music, kids entertainment and festive animation. A new element to this year’s programme is the nightly Box Wonders performance from In Your Space until Sunday December 16 when model toys will come to life from present boxes with a burst of colour light and sound when the Guildhall clock strikes 6 each night. On Sunday, December 16 a Mini Walkabout Procession in Waterloo Place and Guildhall Square from 4pm – 6pm will see King Wenceslas on stilts and six golden geece thrill the crowds of seasonal shoppers.